Everleaf 126 Oats are a late maturing, tall variety. Strong straw strength with fair grain yield makes them a great choice for most situations. Matures approximately 16 days later than Colt. Good bushel weight. Everleaf 126 creates a very dense canopy, thus the leaf to stem ratio is higher resulting in a higher quality forage. When cut prior to boot stage, optimal quality is achieved in both crude protein as well as % digestible fiber. 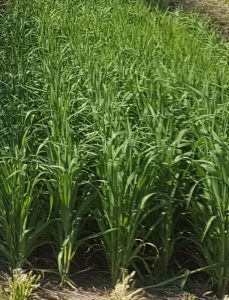 A great choice to plant under irrigation and will resist lodging well. Graze when plants reach around 30 inches in height. Resistant to Stem Rust and Crown Rust. Susceptible to Barley Yellow Dwarf.